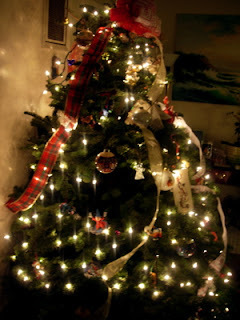 My Magical Collection: ...And Here's The Christmas Tree! ...And Here's The Christmas Tree! This is how our tree looked this year, with all the lights and decorations. Normally we have multi-colored blinking lights, but this year I forgot to take out the box that had those lights, so we only had white lights. We kind of liked the all-white lights (for a change), and we went with that. It turned out to be really nice. WDCC Mickey Mouse - "On Ice"